BeNotForgot.com: 1842 :: Edwards kith or kin? 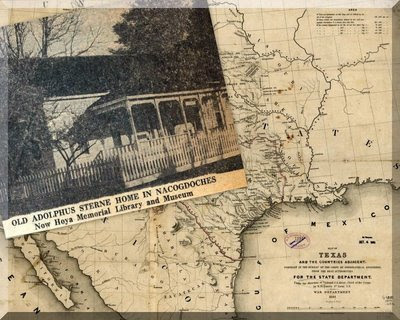 From September 28, 1840, to November 18, 1851, Nicholas Adolphus Sterne kept a diary of his daily activities, which is a valuable source of information on the period of the Republic of Texas (1836-1846). The names of some of our kith 'n kin are scattered through the pages of his diary . . .
On this date in our extended family history . . . the 13th day of July . . . in the year 1842 . . . Nicholas Adolphus Sterne (ca. 1801-1852) penned the following words in his diary . . .
My still unanswered question is . . .
"Who is this niece and nephew with the last name of Edwards?" We have not been able to find them on either the ROBERTS side or the GILL side of the family. This question has already been posed (in 2006) to a study group composed of descendants of George Roberts and Rhoda Payne . . . who are Elisha's parents . . . and my 5th great-grandparents . . . with no results so far . . .
UPDATE . . . April 2019 . . . These Edwards kinfolk are apparently two of the children of Patsy's sister, Hester / Ester Gill, who married Robert Edwards in 1819 in Louisiana . . .
What an interesting blog! Thanks for sharing!